and features of the app itself remain similar to those offered previously. Notably, on the Apple App Store, the Saavn app has been replaced with the new JioSaavn app, however Jio Music remains as a standalone app. The changelog reveals that all Jio network users will be offered 90 days complimentary access to the premium Saavn Pro subscription. As per the changelog shared in version 6.1 of the JioSaavn app on Apple's App Store, the app remains free for all Jio users. Additionally, Jio Music users can access their individual playlists and downloads on the new app. A 90-day free Saavn Pro membership is also available for all Jio prepaid and postpaid subscribers. For existing Saavn users on iOS, the design of the app largely remains the same, albeit with a new JioSaavn branding. The company claims that it has a library of over 45 million tracks, some of which are exclusive to the platform. “So suffice it to say, with Jio as our partner, you'll be getting the same app you know and love, with way more firepower and music than ever before. And there are a ton of great new features and improvements right around the corner, so stay tuned!” noted the music streaming company in the changelog. The app has a file size of about 79MB and requires iPhone, iPad, or iPod touch running iOS 8.0 and above. 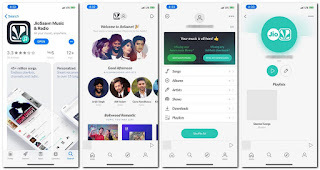 Notably, update has not yet reflected on Google Play and the Saavn app on Android (version 6.0.6) has not received the new branding and logo yet. However, Saavn on Twitter points out that JioSaavn for Android can be expected "soon". To recall, Jio announced in March that the combined entity (Jio Music and Saavn) would have a combined value of $1 billion (roughly Rs. 7,025 crores) that includes an ‘implied valuation' of $670 million (about Rs. 4,700 crores) for Jio Music alone. As part of the deal, Jio was reported to take a stake in Saavn for $104 million (around Rs. 730 crores) with the three co-founders keeping their leadership posts. At the announcement, Jio had announced that it had plans to invest $100 million (roughly Rs. 702 crores) in the joint entity. Notably, this move comes at a time when media reports suggest that music streaming Spotify is gearing up for an official India launch in the next few months. Spotify is the largest paid music streaming service globally, but is largely restricted to only three regions - North America, Europe, and Latin America.